Questa grande residenza si trova a Los Estados, una, gated comunità privata di 40 case di lusso indipendente su fairway del famoso La Quinta Resort e Mountain Course del Club. Questo grande casa privata ha una vista maestosa delle montagne di Santa Rosa direttamente attraverso il 17 ° fairway del La Quinta Resort e Mountain Course del Club. Questa tenuta personalizzato appartato offre privacy, ma è a pochi passi dalle strutture pubbliche del famoso La Quinta Resort & Club. espansive 3.500 interni piedi quadrati della casa comprendono tre suite grande camera da letto, una spaziosa area ricreativa con tavolo da biliardo regolamento, un ufficio / sala multimediale, a tre e bagni di un mezzo, soggiorno con camino a gas, e una zona pranzo aperto adiacente alla piena cucina -Dotato. Il soggiorno, sala da pranzo e camera da letto matrimoniale, anche con un camino a gas, si affacciano piscina privata del residence e centro benessere, e offrono una vista spettacolare delle montagne di Santa Rosa appena al di là del 17 ° fairway, il più alto della famosa Mountain Course del resort. La zona relax della piscina ha un grill a gas e strutture per la ristorazione all'aperto. Cinque ristoranti e negozi interessanti sono a pochi minuti a piedi. Si accettano pagamenti con Visa / Mastercard, contattarci direttamente per ulteriori informazioni. * 3 camere da letto, tutti i re. * Questa casa ha la sua piscina con idromassaggio per il vostro divertimento e non vi è il tennis gratuito nelle vicinanze (contattarci per ulteriori dettagli). * Le strutture pubbliche che includono ristoranti / cocktail bar, negozi, centro benessere e campi da golf sono aperti al pubblico e disponibile per il vostro divertimento. * Si prega di notare che la piscina dell'hotel, il centro fitness e il campo da tennis a pagamento sono riservati agli "ospiti dell'hotel". We loved the house! It was a great plan for 2 or a group and decorated in a sophisticated way. The view can't be beat and great walkability for the resort. We hope to return! We recently spent two wonderful weeks at Casa Grande in Los Estados. What a wonderful place to stay in the Palm Springs area!. The location was ideal, close to restaurants, shops, golf courses and 2 blocks to a spa. The house was fantastic and provided plenty of room with a variety of living areas. We loved the pool/spa area and the privacy of the space. Dennis, the local property manager, was very responsive to any our requests. The nice thing is we only need to call him once in the beginning. The house is very well maintained. We loved our stay and will stay again in the future. We are glad you had such an enjoyable time at our mountain view home - we try to create an environment of various entertainment/living areas throughout, and are proud of our managers who are ready to help our guests if they need anything including ideas for golf, restaurants, activities in the area, etc. My wife and I recently had the pleasure of staying a weekend at this beautiful house and realized that the weekend was too short. We loved the house, the location, the area and can't wait to book another visit. "Living in the house" was like staying in a five star resort without the crowds, ever-present servers and planned activities. We relaxed, enjoyed the pool, the beautiful, but rugged, mountains just outside our living area and the easy access to markets and restaurants. The interiors are beautifully furnished and equipped with anything one would need for a short or extended stay. I highly recommend a week or two stay. Just a quick note to indicate how much we enjoyed our stay at Casa Grande. The house is large, well planned, beautifully furnished, and easy living. 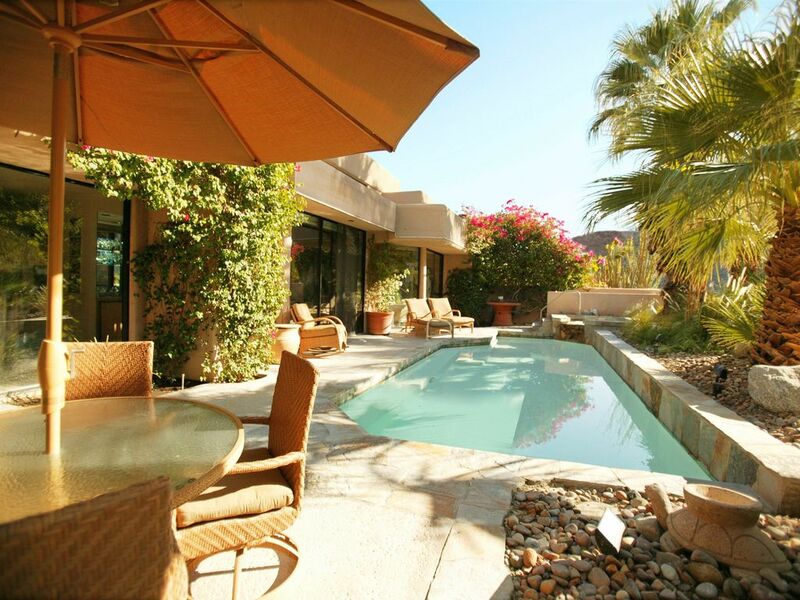 There were four of us on our recent visit, however, six or more (three couples easily) can make this their home while in the Palm Desert Area. The private pool and Jacuzzi are great for relaxing. The golf course, palm trees, and mountains make a great backdrop to the private pool area. We hosted a dinner party while staying there and five couples were able to dine there with ease. My wife enjoyed the beautiful shops. We look forward to staying there again upon our return. My wife and I have stayed at Casa Grande probably five or six time over the years and never thought to write a review. This time was different as we had three couples for a gathering of the guys who were all fraternity brothers back in the early sixties. The place is spectacular for a gathering such as this as the bedrooms provide all the luxury the ladies expected and the social spaces were grand enough for the around the clock socializing as we all relived our lives since college. The layout of the floor plan really facilitates easy movement from living room to dining room to media room to outdoor pool side and the pool table area is a great hang out for the late night reminicing that was going on. The kitchen andBBQ areas were another great social spaces as we took turns cooking some of the meals together. The region has plenty of activity opportunities as everyone knows and we enjoyed them too but the most fun was our time at the La Quita Club with the beautiful outdoor space and live music - we had a grand time dining, listening to the music and watching the sun go down. RENTAL RATE DETAILS: - Rate charge is based on length of stay, nights of stay, time of year, special events and holidays. To check availability and pricing for your specific dates of stay, enter a request and you will receive a response w/ a detailed cost breakdown. This request is needed to generate accurate pricing. La Quinta city tax permit #0110207 HOTEL: The hotel's public facilities which include restaurants/cocktail lounges, shops, spa and golf are open to the public and available for your use. The home has a private pool/spa and free tennis nearby. TO CLARIFY: You do not have use of hotel's private facilities (their pool, their paid tennis/fitness ctr). Those are for hotel guests only. AUTOMOBILE REGULATIONS. Overnight parking is allowed for passenger vehicles only, and only in garages or designated guest parking spaces, not on the street. Remember to leave your gate pass on the dashboard. No recreational vehicles, trucks or trailers of any type (other than electric golf carts) are allowed in the complex overnight.